We love great design, cool technology and anything you can print! 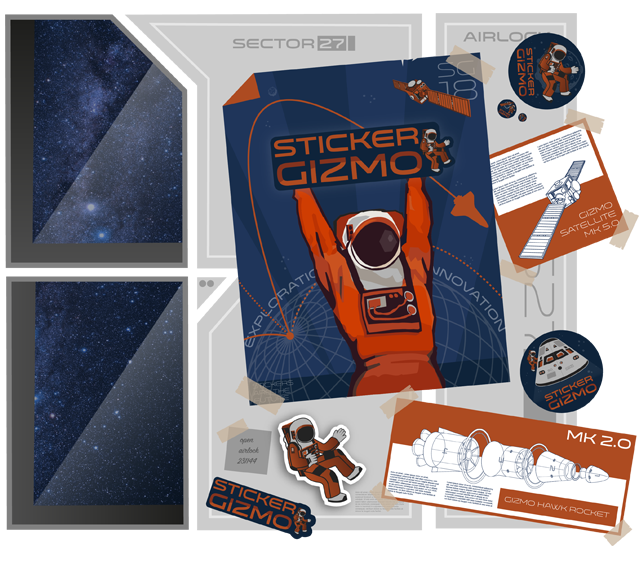 From this passion and being space geeks – StickerGizmo was born! Our mission is to provide an amazing online resource for anybody to design great looking products which are printed on high quality materials, delivered quickly at a great price! Whether it is a single design for your skateboard or product labels for your multi-site massive fast food chain StickerGizmo can work for you. The StickerGizmo Tool provides in browser functionality that you would expect from a creative software package and allows your imagination to create wonderful designs and then order with a click of a button. If you want inspiration or a place to start browse our templates or ready-made stickers. Our creative team have been hard at work publishing great ideas to help you make the best products you can. We also understand that delivery times are important especially if you are running a business, so we offer next day if you order early – see the count down on the homepage! Otherwise it is still a speedy two day deliver. We hope you like the StickerGizmo brand? We love space travel so went for a retro 70’s space theme, a time of great anticipation, excitement, discovery and cool mission patches! What is a 'Gizmo'? According to Collins English Dictionary it is a device or small machine which performs a particular task, usually in a new and efficient way. People often use gizmo to refer to a useful device or machine when they do not know what it is really called. Or if you are of a certain age it could be a small furry animal from the 1984 film Gremlins! However, we think it perfectly describes our design tool and hope you agree - making it easy for you to create.